DC rooftops are busy places. A flyover of the District shows a growing mosaic of rooftop terraces, solar panels, green roofs – and increasingly, retail space. 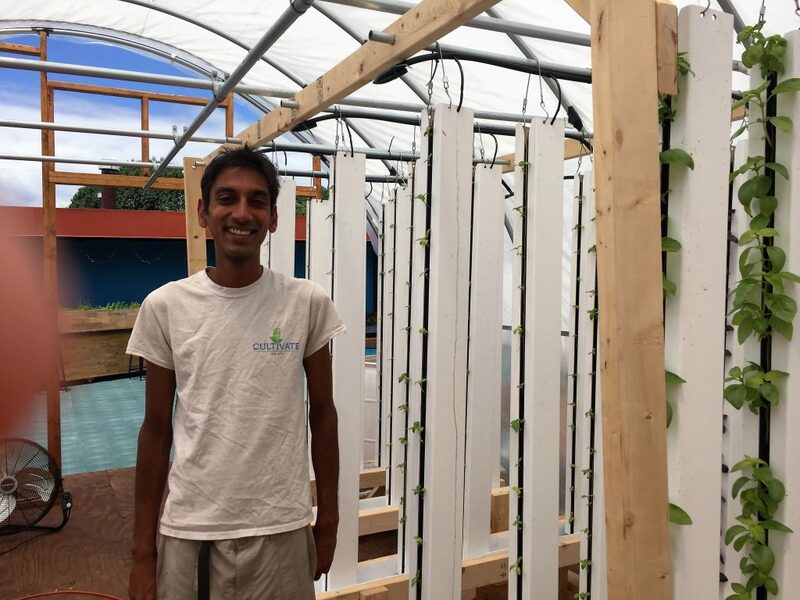 Niraj Ray, CEO of Cultivate the City (CtC) (www.cultivatethecity.com), is just one DC entrepreneur who’s taking advantage of rooftops to run a green business, create jobs, and grow food. I met Ray at H Street Farms, on the roof of the W.S. Jenks & Son hardware store on Bladensburg Road, on a sunny May morning. Ray loves his work, and his enthusiasm for it is obvious. But how did CtC even come about? Ray wanted to grow strawberries, but he didn’t have much space. He started stacking planters and growing strawberries vertically in “towers” to save space and water. The strawberries thrived and set berries well beyond the standard fruiting season. That was 2012. In 2015, Ray started CtC. He now has three fulltime employees and a handful of seasonal part-time staff and interns. His strawberry towers are made from recycled polystyrene (Styrofoam). “These planters are four to five times denser than regular polystyrene and help protect plants from extreme temperatures, both hot and cold.” Ray also sells attractive planters that are made from recycled plastic bottles. CtC uses shredded coconut husks, rather than peat moss, as a growing medium. “Harvesting peat emits tons of CO2 which contributes to climate change. Coconut husks are more sustainable – and there’s an endless supply.” Even the greenhouses are energy efficient and include off-grid thermostats that automatically open and close ventilation panels according to the inside temperature. 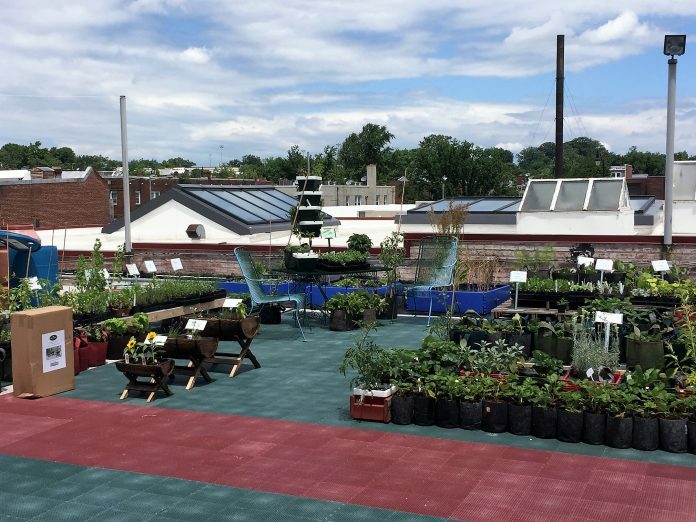 Ray’s business model goes far beyond that of a commercial nursery operation that takes advantage of available roof space. CtC also operates a 6,500-square-foot farm on the roof of Nationals Park for chefs at the stadium. And he’s working with schools to establish gardens and community supported agriculture programs (CSAs) that generate income for the schools. By growing food, students learn important life skills that ultimately expand and improve their diet. Student labor lowers the food production and preparation costs, and the CSAs are offered at a fraction of the price of most around town. At J.O. Wilson Elementary, last year, the proceeds from the CSA provided Thanksgiving food boxes for in-need families in the NoMa area. CtC has similar operations up and running at Gallaudet University, Miner and C.W. Harris elementary schools, and IDEA Public Charter School. Who would have thought that a rooftop could literally provide a business platform? Catherine Plume is a lifelong environmentalist, a writer, and a blogger for the DC Recycler: www.DCRecycler.blogspot.com; Twitter @DC_Recycler. She is also a board member for the DC Chapter of the Sierra Club and Green America, but her perspectives are her own and do not necessarily represent the positions of either organization.